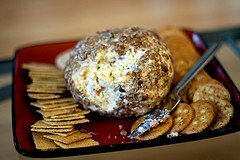 Finding this Party Cheeseball Recipe has brought back some very fond memories. It was given to me from a women I worked with, named Betty, many years ago working at model trains manufacturer in Milwaukee. Betty was a women more than 3 times my age and was the warmest friendliest person I ever met. She brought this appetizer in one day for a treat that I am happy to share. This is her recipe exactly like she hand wrote it for me. Enjoy! Shred cheese yourself. Pre-packaged shredded cheese will make the ball crumbly. Put all ingredients in large mixing bowl. Remove rings, wash hands and mix all ingredients together. Form into ball -- roll in parsley, nuts or both. Chill. Remove from refrigerator 1 hour before serving. Great with Wheat Thins or Ritz Crackers.